The suspected accomplice in the Paris terrorist attacks is believed to be in Syria, having passed through Turkey early this month. Hayat Boumeddiene – the partner of Amedy Coulibaly, one of the dead gunmen – is described by police as “armed and dangerous”. French police launched an intensive search for the 26-year-old, who at one stage was believed to have taken part in the attack on the Jewish supermarket in Paris. Both French and Turkish sources believe she left France after the New Year and passed through Istanbul on January 2. A Turkish official said the French authorities passed on no information about her, a claim which is likely to embarrass the French and raise questions about the effectiveness of intelligence operations and surveillance of terrorist suspects. Prime Minister Manuel Valls has already admitted that intelligence mistakes have been made. An examination of the phone records of both Boumeddiene and the wife of Cherif Kouachi – one of the two brothers who murdered 12 people at Charlie Hebdo’s offices – has shown that 500 calls were exchanged between them last year. Anti-terrorist police believe Boumeddiene and Coulibaly had known one of the Kouachi brothers since 2010. Photos first published by Le Monde newspaper have since circulated widely on social media, showing Boumeddiene and Coulibaly on an apparent training exercise in the rural Cantal department in central France. Covered entirely in black with only her eyes exposed, Boumeddiene is seen firing a crossbow. French media described her as one of seven children whose mother died when she was young and whose delivery-man father struggled to keep working while looking after the family. As an adult, she lost her job as a cashier when she converted to Islam and started wearing the niqab. Le Monde said Boumeddiene wed Amedy Coulibaly in a religious ceremony not recognised by French civil authorities in 2009. The two were questioned by police in 2010 and Coulibaly jailed for his involvement in a botched plot to spring from jail the author of a deadly 1995 attack on the Paris transport system. Among other information to emerge, it has been revealed that Boumeddiene signed a petition against the ban on the burqa in France that went online in 2009. The couple are said to have been living together in a block of flats at Fontenay-au-Roses in the Paris suburbs. A neighbour named as Cyril described a couple who were polite but discreet. “I live down the hall, I would bump into them, the woman was always entirely veiled, not a burka but completely covered. They weren’t nasty, they’d say hello and goodbye, they’d hold the door. I bumped into them many times, they were very nice, never any problems,” he said. 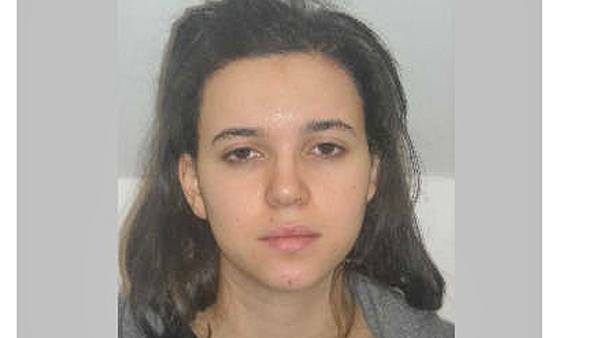 If the latest information is confirmed, then Hayat Boumeddiene was not with her partner when he launched his killing spree in Paris last week, but had already left the country. Amedy Coulibaly is believed to have shot dead policewoman Clarissa Jean-Philippe at Montrouge in southern Paris on Thursday. The following day he took several people hostage at a Jewish supermarket, killing four of his captives before specialist police teams launched their assault. He was shot dead as he tried to attack them.